EAST LANSING – The Michigan Remembers 9-11 Fund has honored three winners of its 2014 scholarship essay contest for Michigan high school juniors and seniors. The contest was established to encourage high school students to research and express their reflections on how the impacts of the Sept. 11, 2001 terrorist attacks affected them, their family members or friends, their communities, or the nation as a whole. Her essay focused on the courage demonstrated by those heroes who made a difference during the tragic events of 9/11/01. She plans to attend Grand Valley State University in the fall to pursue a bachelor of science in nursing. She plans to attend Michigan State University in the fall, but is currently undecided on a course of study. Nicholas Mangopoulos of Okemos won the honorable mention award for his essay “We Were Invincible.” He is enrolled in the Early College Program at Lansing Community College and plans to start attending full time in the spring to study computer engineering. 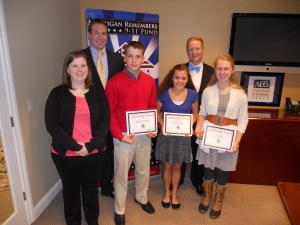 “We were happy to be able to honor the scholarship winners for their strong writing skills and their ability to convey a deep understanding of the 9-11 tragedies despite their young ages at the time the attacks occurred,” said Megan Henriksen, Executive Director of the Michigan Remembers 9-11 Fund. The Michigan Remembers 9-11 Fund is a 501(c)(3) non-profit organization, founded in 2006 by World Trade Center attack survivor Patrick Anderson. The Fund memorializes those with ties to Michigan whose lives were lost on September 11, 2001, and honors those who risk their lives on a daily basis to protect their communities. Donations from the public can be sent to Michigan Remembers 9-11 Fund, 1555 Watertower Place, Suite 100, East Lansing, MI 48823.